You are here: Home 2015 October Why We Need Multigigabit Networks Today? First of all, let’s look at the Evolution happened on the Wireless LAN in the decade. From the exhibition above we can read that the biggest innovation in the history of wireless LAN is the release of 802.11ac Wave 2. Wave 2 of 802.11ac also introduces a new feature called multi-user multiple-input, multiple-output (MUMIMO), which utilizes “beamforming.” With MUMIMO, a Wave 2 802.11ac access point (AP) can send and receive data from up to four radio clients simultaneously. Juxtapose this with a three-stream 802.11n AP or an 802.11ac Wave 1 AP, where each AP can talk to only one client at a time, one after the other. MU-MIMO makes the wireless network much more efficient. 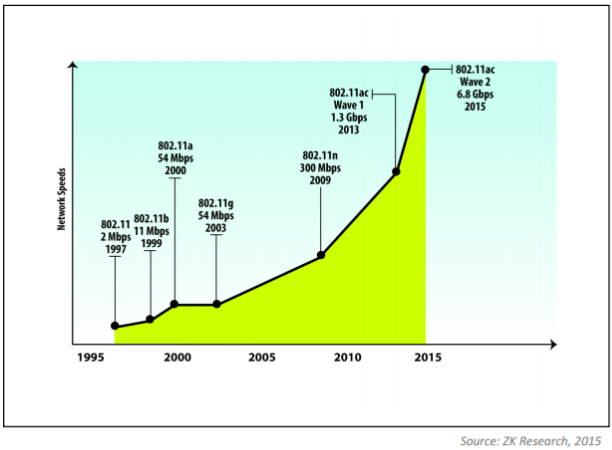 The evolution of WiFi to 802.11ac Wave 2 is a significant step forward for wireless networks. Historically, the wireless network acted very much like a network hub where all of the clients accessing the network shared the available bandwidth. If one of the devices happened to access a bandwidth-consuming application, such as videoconferencing, it would degrade the performance of the network for all users. The combination of increased speed and MU-MIMO enables 802.11ac Wave 2 APs to deliver performance similar to that of a network switch, where bandwidth can be dedicated to individual users. Now, workers can use any application on any device and be assured of consistent application performance. Another important point to understand regarding 802.11ac Wave 2 is that it’s the first wireless technology that will dictate the architecture of the wired network. Historically, the reliability and speed of the wired network greatly exceeded that of the wireless network, so wireless activity or architecture had very little impact on the wired network. Businesses looking to transition to 802.11ac Wave 2 should fully understand the new technology’s requirements for the wired network and choose a solution provider that can minimize the disruption to the business. What’s the Cisco’s 802.11ac Wave 2? As the leader in both wired and wireless networking technology, Cisco has also introduced a unique solution to the challenges of migrating to 802.11ac Wave 2. Yeah, to meet customers’ different needs, the networking giant has developed Multigigabit switches that can provide the necessary wired speeds and power requirements for 802.11ac Wave 2 APs. · Uses standard Category 5E/6 cables: Upgrading cable infrastructure from existing copper cables to higher-speed copper or fiberoptic cables can be a very expensive undertaking. Cisco’s Multigigabit solution operates at a distance of 100 meters using Cat 5E or Cat 6 cables, which constitute more than 95% of the installed cable today. The ability to run over Cat 5E/6 not only will save businesses a substantial amount of labor and cable costs, but also will limit the business disruption from upgrading the cables. · Provides multiple connectivity speeds: Cisco’s Multigigabit enables 802.11ac Wave 2 APs to be connected at 1 Gbps, 2.5 Gbps, 5 Gbps or 10 Gbps. The switch also has an autosense feature that automatically sets the speed of the connection based on bandwidth needs. This makes the deployment of Multigigabit technology almost “plug and play” for network managers. · Delivers a breadth of PoE options: The solution offers the widest range of PoE options in the industry. Customers that use the Multigigabit solution can connect devices to the network using standards-based 15-watt PoE and standardsbased 30-watt PoE+ as well as Cisco’s proprietary 60-watt Universal PoE (Cisco UPOE). Although the Wave 2 APs will connect using PoE+, the UPOE option gives customers the ability to connect a variety of other devices in the future. This may include end points such as digital signs, security cameras or even computers. Cisco’s Multigigabit technology also offers existing customers outstanding investment protection because the solution will be compatible with existing Cisco switching technology. The new Multigigabit products interoperate with two of Cisco’s most widely used access switches: the Catalyst 4500E modular switch and Catalyst 3850 stackable switches. For the Catalyst 4500E, Cisco is introducing a new 48-port Multigigabit line card for the modular converged access switch. The line card has 12 ports that are Multigigabit capable. The Catalyst 3850 stackable converged access switch with Multigigabit capabilities will come in either a 24-port form factor (in which all 24 ports are Multigigabit capable) or a 48-port form factor (in which 12 ports are Multigigabit capable). The new Catalyst 3850s will also have 40 Gbps uplinks to connect the switch to the wired core. Customers with existing Catalyst 3850s can add the new products to the existing stack. In addition to the upgrades to existing products, Cisco has introduced a new compact Ethernet switch: the 3560-CX eight-port switch with two Multigigabit-capable ports. This switch is ideal for smaller businesses or organizations looking to quickly add 802.11ac Wave 2 APs to the network. It is also suitable for enterprises looking to deploy quiet switches closer to end users in collaborative workspaces, retail checkout stations, hotel rooms and more. To help businesses make the transition to a predominantly wireless access edge, Cisco co-founded the NBase-T Alliance in late 2014. The alliance has multiple goals including promoting solutions for more speed over Cat 5E/6 cabling, building momentum for Multigigabit technology and making the solution an industry standard by coordinating with standards bodies, such as the IEEE. Cisco initially founded the alliance with Aquantia, Freescale Semiconductor and Xilinx. However, since then, several other companies have joined the alliance including Cavium, Tehuti Networks, Vitesse, GLGNET, Intel, Brocade and Aruba Networks. Cisco’s Multigigabit technology will help organizations avoid both costly network equipment upgrades and expensive cabling upgrades. Multigigabit technology should be a consideration for any business looking to leverage the speed and quality of 802.11ac Wave 2. The next WiFi standard, 802.11ac Wave 2, will bring speeds of 6.8 Gbps to wireless, which is substantially faster than the existing 1 Gbps wired standard most commonly found at the access edge today. The release of 802.11ac Wave 2 means that workers no longer must make performance trade-offs when connecting over wireless. Now, users can have the flexibility and agility of using wireless with the best connectivity speeds. 802.11ac Wave 2 is the nocompromise wireless technology, and shifting to this technology should be at the top of every business and IT leader’s priority list. · Be aggressive with 802.11ac Wave 2. 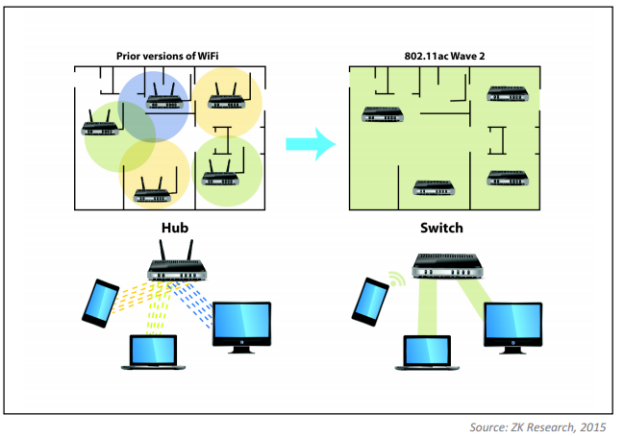 ZK Research believes this version of WiFi to be a game-changing technology because it enables businesses to run any application wirelessly— including those that may not have run well on older versions, such as 4K video, Internet of Things (IoT)-based applications and telepresence. By leveraging 802.11ac Wave 2 speeds, businesses can create new, unique mobile applications to serve their customers and workers better and create a competitive advantage. For example, health care providers can conduct medical imaging and transmit images wirelessly, or school systems can use real-time video streaming to create new ways of educating students. · Choose a partner that can deliver a complete wired and wireless solution. 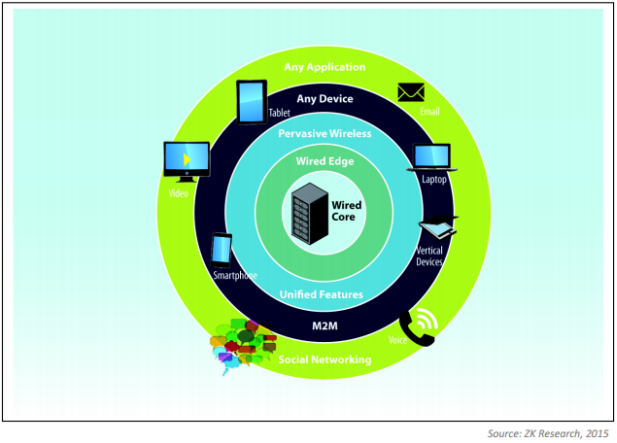 802.11ac Wave 2 is the first WiFi standard that will dictate wired architecture. It’s important to choose a solution provider that can deliver a complete wired and wireless solution. This includes not only the APs and wired switches, but also features such as Multigigabit networking, unified management and integrated security. 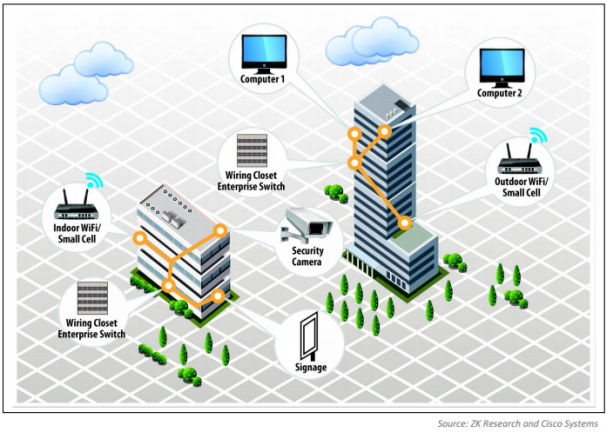 At the time of publication, ZK Research believes Cisco to be the only vendor that can deliver an end-to-end solution. · Embrace consumerization inside the enterprise. The value of 802.11ac Wave 2 will be fully realized when Wave 2–compatible clients are connected to the network. Enterprise IT upgrade cycles are typically three to five years, and they are too slow to catch the flood of Wave 2 devices that will hit the market. Consumers, however, upgrade devices much more rapidly— annually in many cases. By embracing consumerization, businesses can ensure that workers will have the best device to connect to the best network, which is a key to creating new, mobile experiences.